I recently participated in a series of conversations about the use of hormones in beef cattle. Little did I realize that an idea conceived while walking pens one morning would become a hit among my peers. My display consists of pint sized canning jars and M&M’s. I used facts from a beef myths website to calculate the amount of M&M’s it would take to equal levels of nanograms of estrogen in foods. A nanogram is one billionth of a gram used to measure hormones in the blood. I found that using one M&M per nanogram would require buying large amounts of M&M’s. While I would enjoy eating those M&M’s I decided for travel purposes I would divide the levels by six to show levels of estrogen in food. healthy food choices for yourselves and your family. Recently I was in a HyVee in Omaha. 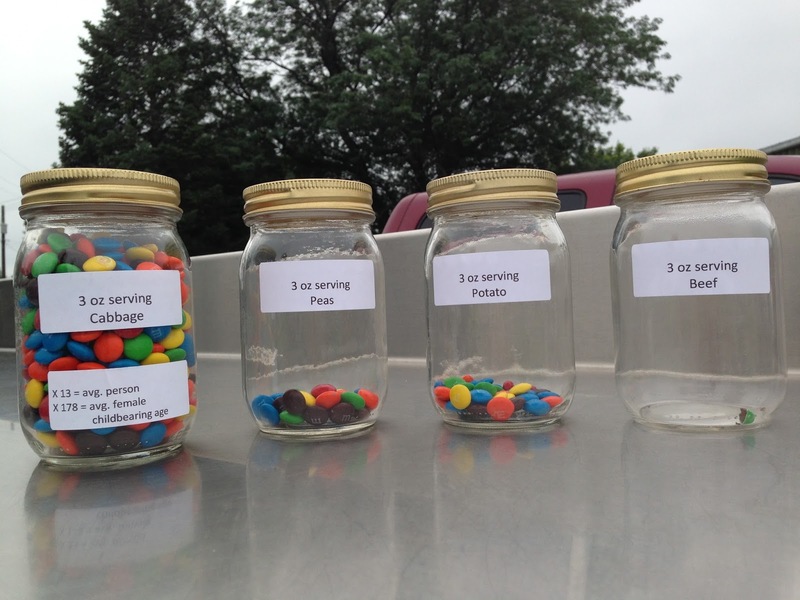 I had several kids interested in eating my M&M’s but what really amazed me was how quick they caught on to the fact that we have hormones present in many of the foods we eat as well as even larger amounts in our bodies. The parents would confirm that they were concerned about hormone levels in beef. After allowing me to explain how we use hormone implants in cattle as well as the M&M visual they agreed that this was not an issue to prevent them from buying beef. information about farmers and food production. 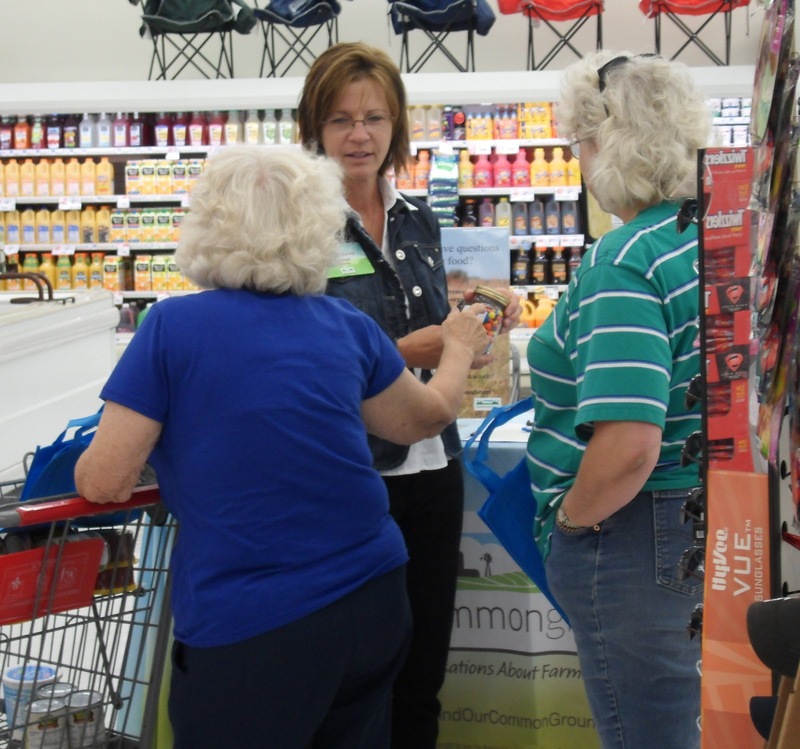 As a volunteer for Commonground and an advocate for agriculture I have found that listening is the most important skill I can use when reaching out to consumers. If it is a concern for the consumer then it is a concern for me to clarify what the consumer wants and needs to know. Sometimes it means sharing facts in a manner that a consumer can relate to and then encouraging them seek further information from reliable sources. wow, sounds cool mom. You just hung out in Hyvee all day and talked to people about their food? I was in the store for three hours during a Health Fair they were hosting. It is very interesting to visit with people and hear their concerns and questions! I think there's more getting put into our beef then just estrogen. I am probably wrong, but i think growth hormones are different then Estrogen. Its interesting indeed. But I think it'd do better if your group would actually have several cuts of meat tested to find out what the “common” “item” (for lack of a better word) is found in our meat. Since most of our Beef comes from feedlots & not grass feed cattle, there'll be different things found. And I doubt that anyone, unless they are on a diet, eats just 3 oz's of beef. So it really should be a bit more realistic for most. Especially since not all of us eats cabbage. Thank you for reading my post and for sharing with me your comments. Estrogen is used as a growth hormone for cattle. I do have a link that shares more information about hormones http://www.bestfoodfacts.org/food-for-thought/hormones_beef If you would like more detail about implants you can go to http://www.caes.uga.edu/publications/pubDetail.cfm?pk_ID=7430 I would recommend on that last link to scroll down to where it talks about safety if the first part seems irrelevant. Our beef is tested everyday at packing plants to look for any possible residue issues. We are fortunate to have so many benchmarks in place for food safety in our country. At the feedlot we are also very careful with our use of antibiotics so that no residues are in the meat. The amount of hormones in grass fed cattle is very close to the same as feedlot cattle as is mentioned in the previous websites. I realize 3 ounces seems small. If you would use a 1/4 pound burger as an example for the size of meat then the M&M would increase in size very little. When trying to talk about nanograms I found it hard to show one billionth of a gram so M&M's were my substitute. It surprises some people to know that even though we feed cattle our meat that we eat comes from the grocery store. If I was concerned about the practices of those of us in this business then we wouldn't do that and I wouldn't let my five grown children buy their meat from the store. Can you tell me what your concerns are about what is in the meat? I would love to continue the conversation if you would like to. Your comment about cabbage made me smile as I only eat cabbage when I eat cole slaw! The surprise for many seems to have been that there is estrogen in so many other foods. Thank you. Please let me know if you have any further questions about how we care for our cattle and what they receive.